The Acadians (French: Acadiens, IPA: [akadjɛ̃]) are the descendants of French colonists who settled in Acadia during the 17th and 18th centuries, some of whom are also descended from the Indigenous peoples of the region. [a] The colony was located in what is now Eastern Canada's Maritime provinces (Nova Scotia, New Brunswick, and Prince Edward Island), as well as part of Quebec, and present-day Maine to the Kennebec River. Acadia was a distinctly separate colony of New France. It was geographically and administratively separate from the French colony of Canada (modern-day Quebec). As a result, the Acadians and Québécois developed two distinct histories and cultures. They also developed a slightly different French language. France has one official language and to accomplish this they have an administration in charge of the language. Since the Acadians were separated from this council, their French language evolved independently, and Acadians retain several elements of 17th-century French that have disappeared in France. The settlers whose descendants became Acadians came from many areas in France, but especially regions such as Île-de-France, Normandy, Brittany, Poitou and Aquitaine. Acadian family names have come from many areas in France. For example, the Maillets are from Paris; the LeBlancs of Normandy; the surname Melançon is from Brittany, and those with the surnames Bastarache and Basque came from Aquitaine. Acadian French (a variety of French with 370,000 speakers in Canada), English, or both; some areas speak Chiac; those who have resettled to Quebec typically speak Quebec French. During the French and Indian War (the North American theater of the Seven Years' War), British colonial officers suspected Acadians were aligned with France after finding some Acadians fighting alongside French troops at Fort Beausejour. Though most Acadians remained neutral during the French and Indian War, the British, together with New England legislators and militia, carried out the Great Expulsion (Le Grand Dérangement) of the Acadians during the 1755–1764 period. They deported approximately 11,500 Acadians from the maritime region. Approximately one-third perished from disease and drowning. The result was what one historian described as an ethnic cleansing of the Acadians from Maritime Canada. Other historians indicate that it was a deportation similar to other deportations of the time period. Most Acadians were deported to various American colonies, where many were forced into servitude, or marginal lifestyles. Some Acadians were deported to England, to the Caribbean, and some were deported to France. After being expelled to France, many Acadians were eventually recruited by the Spanish government to migrate to present day Louisiana state (known then as Spanish colonial Luisiana), where they developed what became known as Cajun culture. In time, some Acadians returned to the Maritime provinces of Canada, mainly to New Brunswick because they were barred by the British from resettling their lands and villages in what became Nova Scotia. Before the US Revolutionary War, the Crown settled New England Planters in former Acadian communities and farmland as well as Loyalists after the war (including nearly 3,000 Black Loyalists, who were freed slaves). British policy was to assimilate Acadians with the local populations where they resettled. 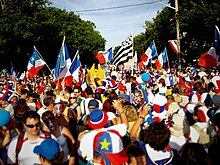 Acadians speak a variety of French called Acadian French. Many of those in the Moncton area speak Chiac and English. The Louisiana Cajun descendants speak a variety of American English called Cajun English, with many also speaking Cajun French, a close relative of Acadian French from Canada, but influenced by Spanish and West African languages. During the early 1600s, about sixty French families were established in Acadia. They developed friendly relations with the Wabanaki Confederacy (particularly the Mi'kmaq), learning their hunting and fishing techniques. The Acadians lived mainly in the coastal regions of the Bay of Fundy; farming land reclaimed from the sea through diking. Living in a contested borderland region between French Canada (modern Quebec) and British territories, the Acadians often became entangled in the conflict between the powers. Over a period of seventy-four years, six wars took place in Acadia and Nova Scotia in which the Confederacy and some Acadians fought to keep the British from taking over the region (See the four French and Indian Wars as well as Father Rale's War and Father Le Loutre's War). While France lost political control of Acadia in 1713, the Mí'kmaq did not concede land to the British. Along with some Acadians, the Mi'kmaq from time to time used military force to resist the British. This was particularly evident in the early 1720s during Dummer's War but hostilities were brought to a close by a treaty signed in 1726. With the founding of Halifax in 1749 the Mi'kmaq resisted British (Protestant) settlements by making numerous raids on Halifax, Dartmouth, Lawrencetown and Lunenburg. During the French and Indian War, the Mi'kmaq assisted the Acadians in resisting the British during the Expulsion of the Acadians. In the Great Expulsion (le Grand Dérangement), after the Battle of Fort Beauséjour beginning in August 1755 under Lieutenant Governor Lawrence, approximately 11,500 Acadians (three-quarters of the Acadian population in Nova Scotia) were expelled, their lands and property confiscated, and in some cases their homes burned. The Acadians were deported throughout the British eastern seaboard colonies from New England to Georgia. Although measures were taken during the embarkation of the Acadians to the transport ship, some families became split up. After 1758, thousands were transported to France. Most of the Acadians who went to Louisiana were transported there from France on five Spanish ships provided by the Spanish Crown to populate their Louisiana colony and provide farmers to supply New Orleans. The Spanish had hired agents to seek out the dispossessed Acadians in Brittany and the effort was kept secret so as not to anger the French King. These new arrivals from France joined the earlier wave expelled from Acadia, creating the Cajun population and culture. 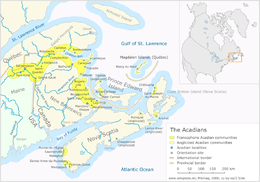 The Acadians today live predominantly in the Canadian Maritime provinces, as well as parts of Quebec, Louisiana and Maine. In New Brunswick, Acadians inhabit the northern and eastern shores of New Brunswick, from Miscou Island (French: Île Miscou) Île Lamèque including Caraquet in the center, all the way to Neguac in the southern part, Grande-Anse in the eastern part and Campbellton through to Saint-Quentin in the northern part. Other groups of Acadians can be found in the Magdalen Islands and throughout other parts of Quebec. Many Acadians still live in and around the area of Madawaska, Maine where the Acadians first landed and settled in what is now known as the St. John Valley. There are also Acadians in Prince Edward Island and Nova Scotia such as Chéticamp, Isle Madame, and Clare. East and West Pubnico, located at the end of the province, are the oldest regions still Acadian. Notable Acadians in the 18th century include Noël Doiron (1684–1758). Noel was one of more than 350 Acadians that perished on the Duke William on December 13, 1758. Noel was described by the Captain of the Duke William as the "father of the whole island", a reference to Noel's place of prominence among the Acadian residents of Isle St. Jean (Prince Edward Island). For his "noble resignation" and self-sacrifice aboard the Duke William, Noel was celebrated in popular print throughout the 19th century in Britain and America. Noel also is the namesake of the village Noel, Nova Scotia. More recent notable Acadians include singers Angèle Arsenault and Edith Butler, singer Jean-François Breau, writer Antonine Maillet; film director Phil Comeau; singer-songwriter Julie Doiron; artist Phoebe Legere, boxers Yvon Durelle and Jacques LeBlanc; pitcher Rheal Cormier; former Governor General Roméo LeBlanc; former premier of Prince Edward Island Aubin-Edmond Arsenault, the first Acadian premier of any province and the first Acadian appointed to a provincial supreme court; Georges Hebert, guitarist – most notably having played with Anne Murray for over 30 years, as well as for the New Brunswick Playboys 1960s rock band; Aubin-Edmond Arsenault's father, Joseph-Octave Arsenault, the first Acadian appointed to the Canadian Senate from Prince Edward Island; Peter John Veniot, first Acadian Premier of New Brunswick; and former New Brunswick premier Louis Robichaud, who was responsible for modernizing education and the government of New Brunswick in the mid-20th century. Singers Beyoncé and Solange Knowles have Acadian ancestry. Prominent Louisiana Acadians include Senator Dudley J. LeBlanc, singer-songwriter Zachary Richard, and historian and President of the Council for the Development of French in Louisiana (CODOFIL) William Arceneaux. Paul, Daniel N. (2006). We Were Not the Savages: Collision Between European and Native American Civilizations (3rd ed.). Fernwood. pp. 38–67, 86, 97–104. ISBN 978-1-55266-209-0. Plank, Geoffrey (2004). An Unsettled Conquest: The British Campaign Against the Peoples of Acadia. University of Pennsylvania Press. pp. 23–39, 70–98, 111–14, 122–38. ISBN 978-0-8122-1869-5. Wicken, William (1998). "Re-examining Mi'kmaq–Acadian Relations, 1635–1755". In Sylvie Depatie; Catherine Desbarats; Danielle Gauvreau; et al. (eds.). Vingt Ans Apres: Habitants et Marchands [Twenty Years After: Inhabitants and Merchants] (in French). McGill-Queen's University Press. pp. 93–114. ISBN 978-0-7735-6702-3. JSTOR j.ctt812wj. Bell, Winthrop Pickard (1961). The Foreign Protestants and the Settlement of Nova Scotia: The History of a Piece of Arrested British Colonial Policy in the Eighteenth Century. University of Toronto Press. p. 405. Many of the Acadians and Mi'kmaq people were mixed bloods, foreign aboriginals or métis example, when Shirley put a bounty on the Mi'kmaq people during King George's War, the Acadians appealed in anxiety to Mascarene because of the "great number of Mulattoes amongst them". ^ "Detailed Mother Tongue, Canada– Île-du-Prince-Édouard". Archived from the original on July 25, 2009. ^ "File not found - Fichier non trouvé". statcan.ca. Retrieved 2 April 2016. ^ Pritchard, James (2004). In Search of Empire: The French in the Americas, 1670-1730. Cambridge University Press. p. 36. ISBN 978-0-521-82742-3. Abbé Pierre Maillard claimed that racial intermixing had proceeded so far by 1753 that in fifty years it would be impossible to distinguish Amerindian from French in Acadia. ^ Landry, Nicolas; Lang, Nicole (2001). Histoire de l'Acadie. Les éditions du Septentrion. ISBN 978-2-89448-177-6. ^ Griffiths, N.E.S. (2005). From Migrant to Acadian: A North American Border People, 1604-1755. McGill-Queen's University Press. p. 47. ISBN 978-0-7735-2699-0. ^ a b Lockerby, Earle (Spring 1998). "The Deportation of the Acadians from Ile St.-Jean, 1758". Acadiensis. XXVII (2): 45–94. JSTOR 30303223. ^ John Faragher. Great and Nobel Scheme. 2005. ^ Han, Eunjung; Carbonetto, Peter; Curtis, Ross E.; Wang, Yong; Granka, Julie M.; Byrnes, Jake; Noto, Keith; Kermany, Amir R.; Myres, Natalie M. (2017-02-07). "Clustering of 770,000 genomes reveals post-colonial population structure of North America". Nature Communications. 8: 14238. doi:10.1038/ncomms14238. ISSN 2041-1723. PMC 5309710. PMID 28169989. ^ Parkman, Francis (1914) . Montcalm and Wolfe. France and England in North America. Little, Brown. ^ Grenier, John (2008). The Far Reaches of Empire: War in Nova Scotia, 1710–1760. University of Oklahoma Press. ISBN 978-0-8061-8566-8. ^ Patterson, Stephen E. (1998). "Indian-White Relations in Nova Scotia, 1749–61: A Study in Political Interaction". In Buckner, Phillip Alfred; Campbell, Gail Grace; Frank, David (eds.). The Acadiensis Reader: Atlantic Canada Before Confederation. pp. 105–106. ^ Patterson, Stephen E. (1994). "1744–1763: Colonial Wars and Aboriginal Peoples". In Phillip Buckner; John G. Reid (eds.). The Atlantic Region to Confederation: A History. University of Toronto Press. p. 144. doi:10.3138/j.ctt15jjfrm (inactive 2019-03-10). ISBN 978-1-4875-1676-5. JSTOR 10.3138/j.ctt15jjfrm. ^ Faragher (2005), pp. 110–112. ^ For the best account of Acadian armed resistance to the British, see Grenier, John. The Far Reaches of Empire. War in Nova Scotia, 1710-1760. Norman: U of Oklahoma P, 2008. ^ Holmes, Jack D.L. (1970). A Guide to Spanish Louisiana, 1762-1806. A. F. Laborde. p. 5. 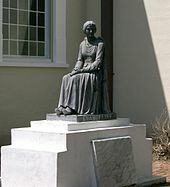 ^ "Acadian Memorial - The Eternal Flame". Retrieved October 18, 2012. ^ "Acadian Flag". Acadian-Cajun.com. Retrieved 2011-10-02. ^ "A New England Acadian Flag". Archived from the original on 2011-09-07. Retrieved 2011-10-02. ^ Scott, Shawn; Scott, Tod (2008). "Noel Doiron and East Hants Acadians". The Journal of Royal Nova Scotia Historical Society. 11: 45. ^ Journal of William Nichols, "The Naval Chronicle", 1807. ^ Frost, John (1846). The Book of Good Examples; Drawn From Authentic History and Biography. New York: D. Appleton & Co. p. 46. ^ "The Saturday Magazine", New York: 1826, p. 502. Scott, Michaud. "History of the Madawaska Acadians". Retrieved 2008-03-05. .